Photographs Vol. III is a photograph album that was rebound using a detachable leaf structure which maintains the album in a bound format and also allows for the removal and exhibition of individual photographs from the album (Fig. 1). 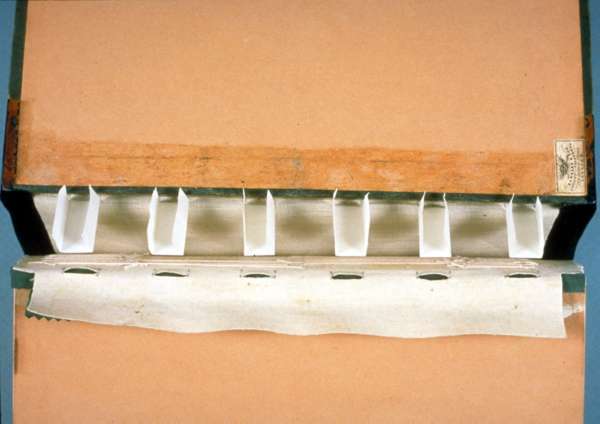 In this structure, the back hinge, which attaches the text block to the cover with a tab and slot connection, can be disconnected to access the sewing. Each gathering in the text block is sewn to a stiff sewing support with its own length of thread, which allows individual gatherings to be removed and reinserted without disrupting the overall sewing structure. This paper discusses the treatment rationale and procedures used for the detachable leaf structure. Fig. 1 Detachable leaf structure, showing sewing support, parchment tabs, and one gathering that has been removed. Photograph albums are books that tell a story through their images, but often the album that the story lives in, is in poor condition. In general, the deteriorated condition of albums is due to the non-durable materials used in their construction, and the use and the storage they have received. 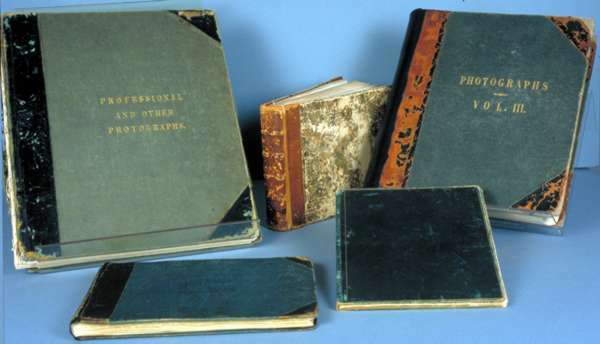 Some albums, however, have been damaged because one or many leaves have been removed, frequently for the exhibition of their unique images. The album entitled Photographs Vol. III by Lewis Carroll was selected for treatment because its original binding structure had failed. 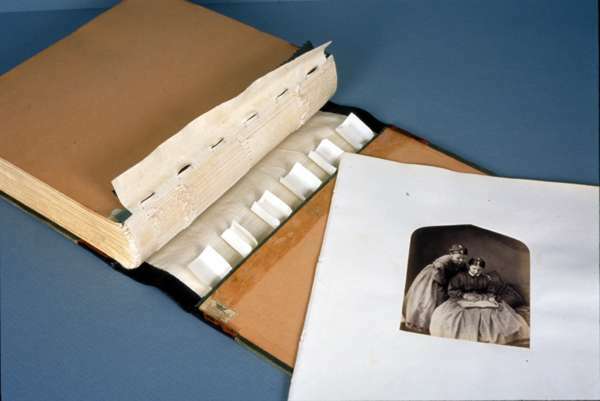 The condition of the photographs and the text block paper was excellent, but the sewing was broken, the covers were detached, the original spine leather was missing, and a later cloth spine had become detached. As with any book, when a photo album comes to the HRHRC book lab for treatment, our choices of procedures include—leaving the item as it is and providing a housing, or mending, rebinding, or reformatting the volume. The Harry Ransom Humanities Research Center (HRHRC) is a Special Collections Library where the curatorial and administrative staff places strong emphasis both on maintaining artifacts in their original state and on encouraging their careful handling. If the condition of a book or album allows, our customary solution is to maintain the original presentation by performing minor mends and constructing a housing. 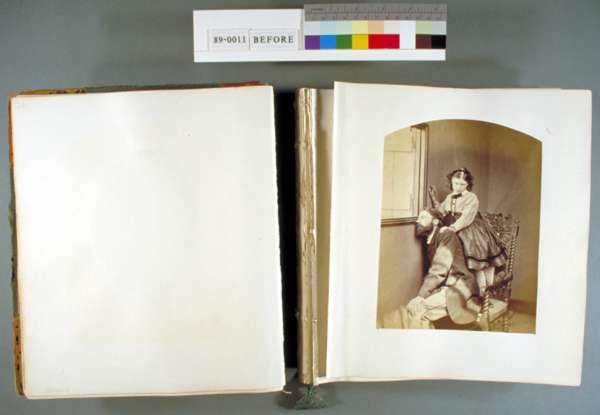 Due to the extensive damage to the binding structure and the relatively frequent requests to exhibit individual photographs from Carroll's album, the option of permanently disbinding this album could have been considered. However, the curator of Photography, Roy Flukinger, felt that it was very important to maintain the album format because it was the way Carroll himself presented his work. Fig. 2 Photographs Vol. III, front cover. Fig. 3 Photographs Vol. III, opening. 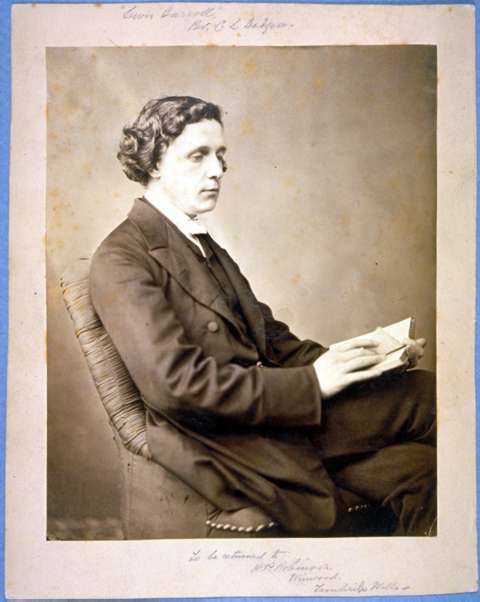 Charles Lutwidge Dodgson (Fig.4), known to most of us as Lewis Carroll, the author of Alice in Wonderland, was a man of diverse interests including mathematics, logic, photography, art, theatre, religion, and science. He was born in 1832, in the parsonage of Daresbury in Cheshire, England. His interest in writing manifested itself early in the poems, essays, narratives and four family magazines that he wrote or compiled. As a tutor and then lecturer in Mathematics at Christ Church, Oxford, he published dozens of monographs, and other publications on Mathematics and Logic. Morton Cohen, one of Dodgson's biographers, notes that in addition to writing the texts of his books, Dodgson was often directly involved with the production of many of these, most notably the Alice books. At the age of 24, Dodgson was introduced to photography and he bought his first camera and photographic outfit for making wet collodion negatives. Some of his earliest photos were of the Liddell children, including The Alice for whom the story was written (Fig. 5). Fig. 4 Self-portrait by Lewis Carroll. Fig. 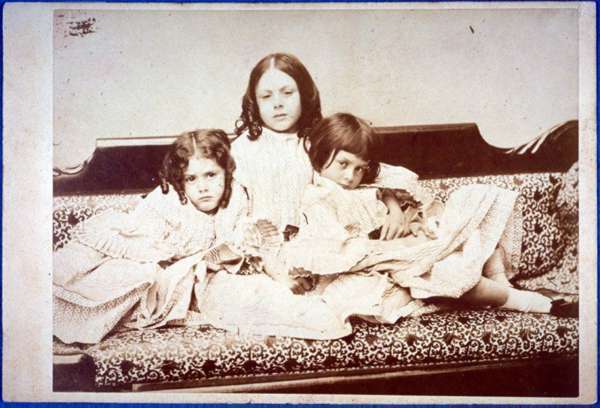 5 Photograph of Alice Liddell (right) and sisters by Lewis Carroll. 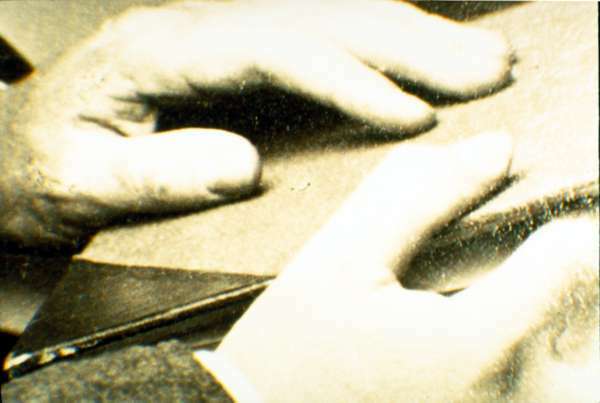 Almost without exception, Dodgson used albums for the presentation of his photographic images and he mentions his albums in many diary entries and letters. He would show his albums to prospective subjects, and to help them choose photographs that they would like to have copied. Dodgson also had many of his sitters sign the album page where their photograph would be placed, as can be understood through this exchange between him and Dymphna Ellis (Figs. 6 and 7). "Of course I left something behind—always do: this time it was my album of photographs (and autographs). And we also forgot to get your names written in it. So will you please turn 2 or 3 pages on after "Mary Millais", and then sign your name in the same place.... And then will you send it by train to Croft Rectory, Darlington. Thank you#8211;much obliged." Fig. 7 Letter from Dodgson to Dymphna Ellis, July 29, 1865 (Cohen 1979 75). 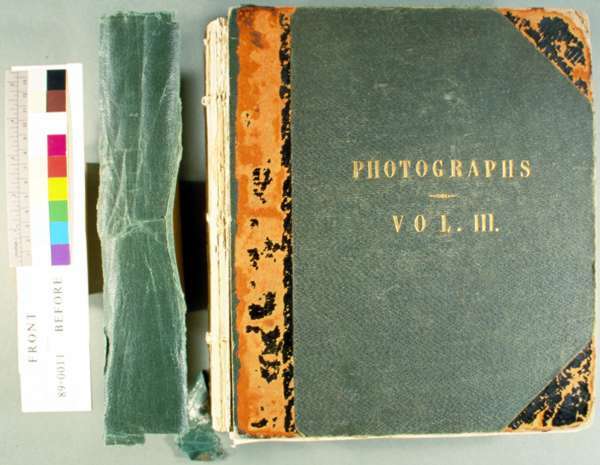 Of the twelve known photograph albums that Dodgson assembled and that contain his images, five are in the Ransom Center collections. For the most part, he photographed distinguished people and children, but his work also includes images of landscapes, architecture, and art objects. He also collected carte-de-visite portraits and the work of other photographers. The album Photographs Vol. III , assembled in the mid- to late-1860's, contains 115 of Dodgson's autographed portraits of celebrities and children. Fig. 8 The Carroll albums at HRHRC. Four of these are bound in green cloth or leather. Delights to see in beds of cauliflower. Album leaves are handled and turned just like the pages of novels. Even careful handling can further damage deteriorated photographs, brittle paper, and fragile binding components. Therefore, before deciding to rebind the Carroll album, the physical condition of the photos themselves, their attachment to the album leaves, the condition of the album leaves, and the condition of the cover were examined. Raking light examination of a representative albumen print from the Carroll album did not reveal deterioration such as cracking or crazing of the albumen layer. If present, this type of deterioration could be exacerbated when the photograph is flexed during normal use of the album. Contrasting a representative photograph (2x magnification, with a Wild reflecting light binocular microscope ) (Fig. 9) with an albumen print from another album that does exhibit cracking (Fig 10), suggests that the Carroll print was in good condition. Fig 9 Photograph from Carroll album (2x magnification). 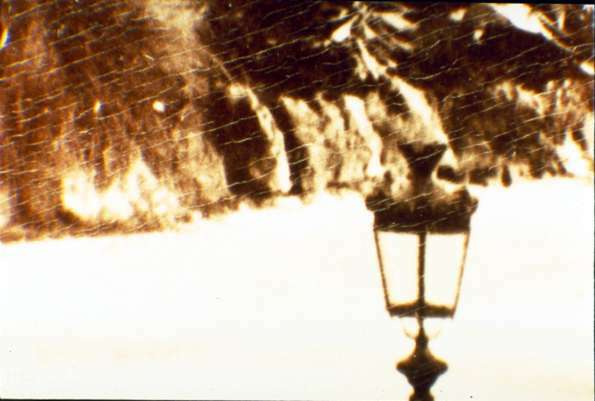 Fig 10 Photograph exhibiting crazing of the albumen layer (2x magnification). Fig 11 Leaf from the Carroll album. 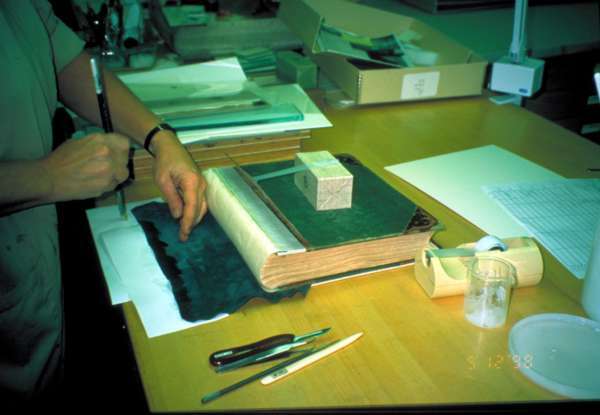 A visual inspection of the text block and a tactile examination of a blank leaf indicated that the paper remained flexible and strong even at the spine folds (Fig. 11). This would be expected of a good quality paper. 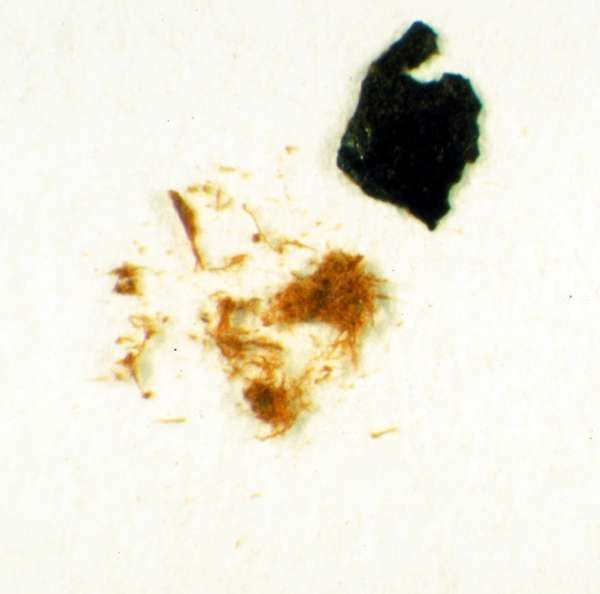 Discrete fiber analysis using an Ortholux polarizing light microscope identified the paper to be composed of linen and cotton fibers. 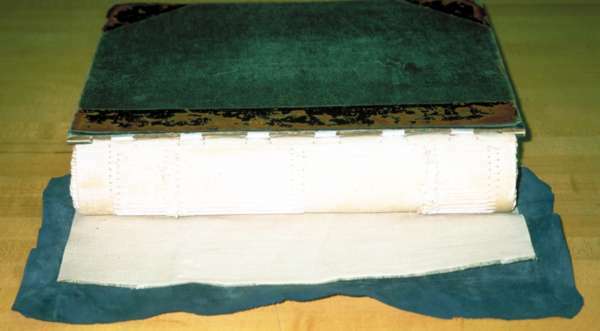 The straight-grained sheepskin spine and corners of the binding were severely deteriorated (Fig.12). 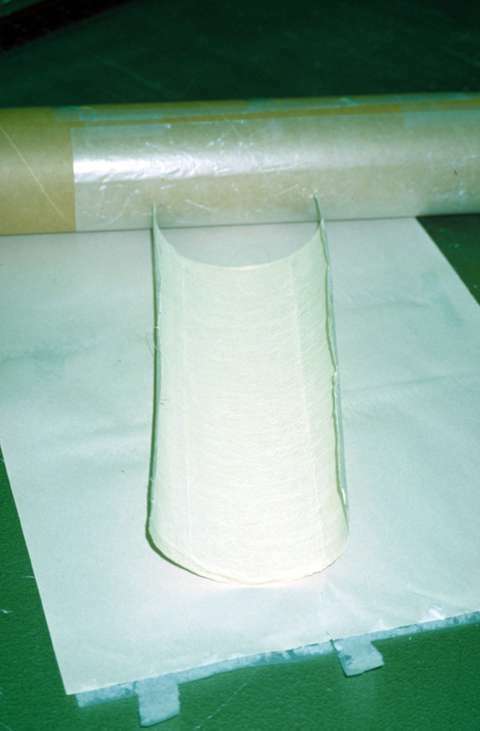 A comparison of leather fibers from the album with samples identified by the Science and Technology for Environmental Protection (STEP) Leather Project reinforced this observation. The STEP Leather Project determined a scale for leather coherence, from coherent at #1 and #2 to very powderous at #4 and #5 (Fig 13). This process was described and samples were chosen during a workshop conducted by Chris Calnan at the HRHRC (Fredericks). 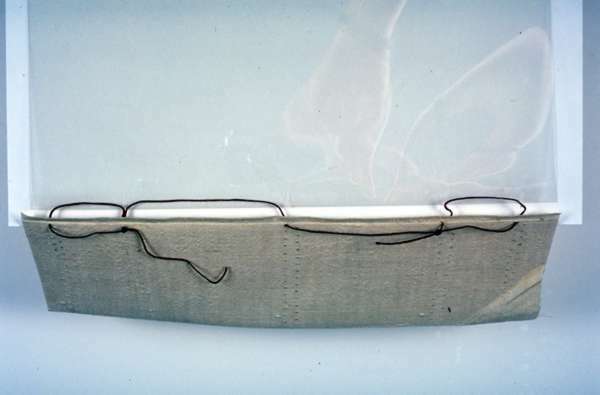 The leather fibers in the sample from the Carroll album (Fig. 14) were very powderous. Although the original, deteriorated leather will not be flexed during use, consolidation with a consolident, such as Klucel G™, was warranted. Fig. 12 Detail of deteriorated covering leather. Fig. 13 Fiber sample of leather from the Carroll album (4x magnification). Fig. 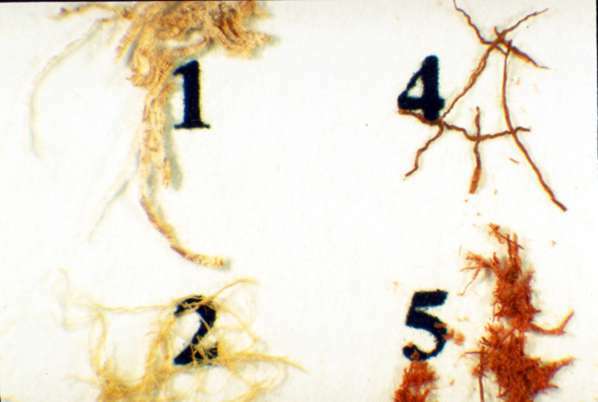 14 Fiber samples at the various levels of deterioration (4X magnification). Although the leather was in bad condition, the photographs and text paper were in good condition. The album format and the evidence of its use were important to the context of Carroll's work. Moreover, the original covers bear Dodgson's own meticulous listing of the sitters he chose to photograph. Scholars and the public frequently ask to see this album and there are many requests to exhibit these images. Keeping these factors in mind, a structure that accommodated all the original materials and that allowed for the removal and exhibition of individual photographs was designed. Fig. 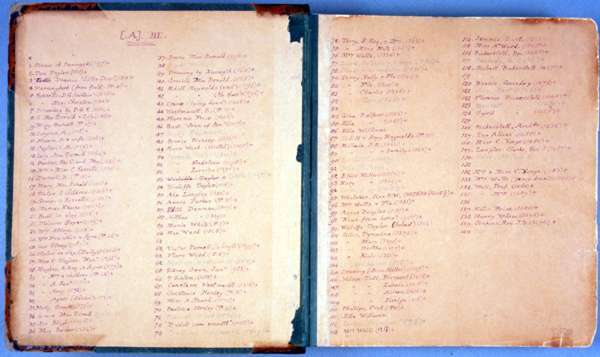 15 Pastedown and flyleaf with Carroll's handwritten index. The following describes only the sewing and the text to cover attachment of the detachable leaf structure, both modifications of traditional binding structures. Paper treatments, such as tear mending and basic binding procedures were completed in a customary manner. Although not shown here, a model of the Carroll album was made to work out the design of the detachable leaf structure. 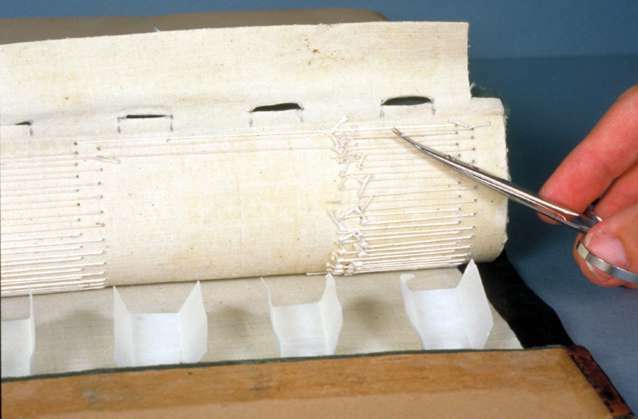 In general, the gatherings of sewn books are connected to each other by a running length of thread which often wraps around a support at the sewing stations. In the sewing structure used for this album, a series of sewing holes for each gathering was drilled through a stiff sewing support, and each gathering was attached to the sewing support with its own length of thread (Fig. 16). 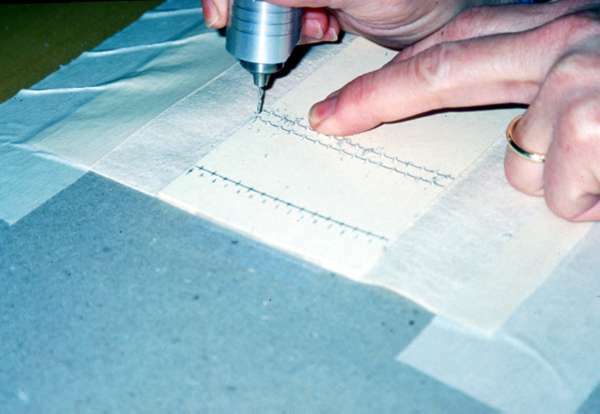 This method of sewing was inspired by the work of book conservators at the Library of Congress, the Newberry and elsewhere in the U.S., who were experimenting with non-adhesive binding structures during the 1970's. 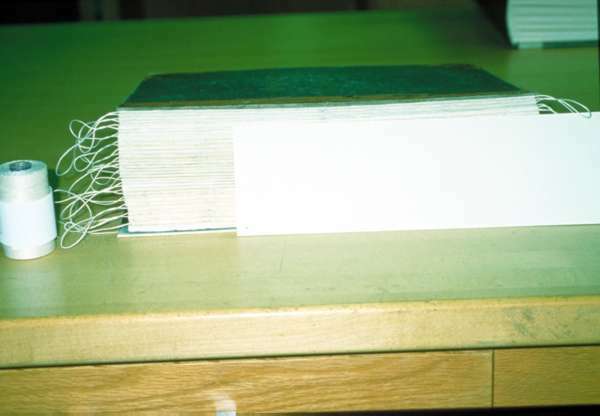 One type of historical binding structure that inspired these experiments was the European ledger binding. An article that emerged from this research was "An Experimental Book Structure for Conservation" written by Linda McWilliams Ogden. 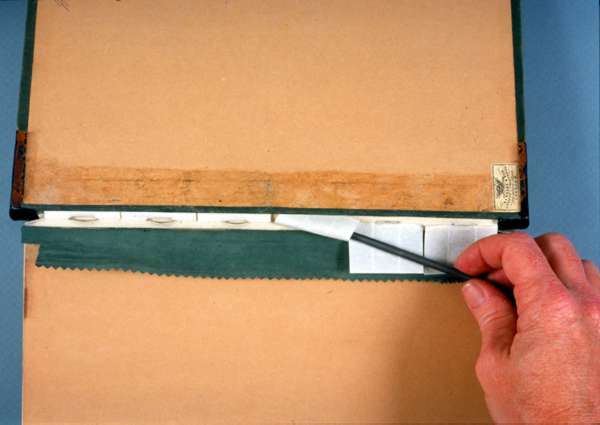 It describes the use of a slotted, stiff laminate as a sewing support and results in a sewing structure similar to that in Figure 17. Fig. 16 Sewing support for Photographs Vol. III. Fig. 17 Slotted, stiff sewing support. The sewing support for Photographs Vol. III was made of a medium-weight piece of parchment cut to the full size of the back of the text block and sandwiched between two pieces of airplane linen (Fig. 18). 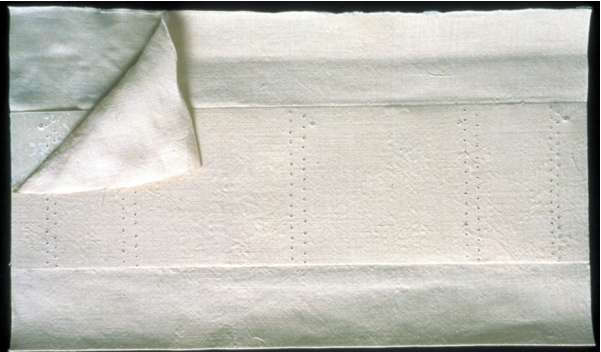 The linen extends about two inches beyond the parchment on either side to make flanges. These linen flanges provide the means to reattach the covers. After adhering the linen and parchment, a rounded shape was imparted to the sewing support by drying it taped to a tube (Fig. 19). Fig. 18 Construction of sewing support. Fig. 19 Imparting a rounded shape to sewing support. The size of the sewing support and the location of the sewing holes was determined by making a rubbing of the spine on tracing paper (Fig. 20). Because the location of each sewing station in this support was to be pre-drilled, it had to correspond exactly to the location of the sewing holes in each individual gathering. Before making the rubbing, sewing thread was looped through the center of each gathering in order to approximate the natural spacing of the gatherings after the book was resewn (Fig. 21). The position of the sewing holes for the gatherings was transferred from the rubbing by pricking through the lines on the tracing paper to a template made of lightweight paper board. This template was used to drill the sewing holes in the sewing support with the Fordham drill (Fig. 22). In order to maintain the full strength of the sewing support, the sewing stations were staggered in two rows. 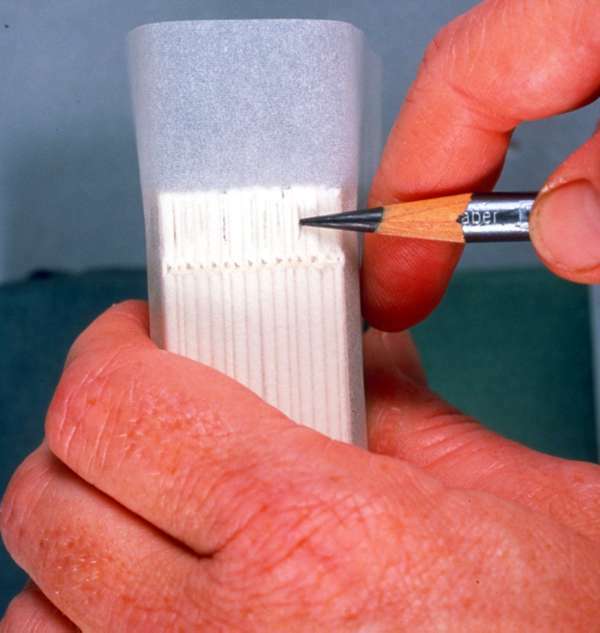 This also makes it easier to identify the length of thread that attaches a particular gathering to the support. 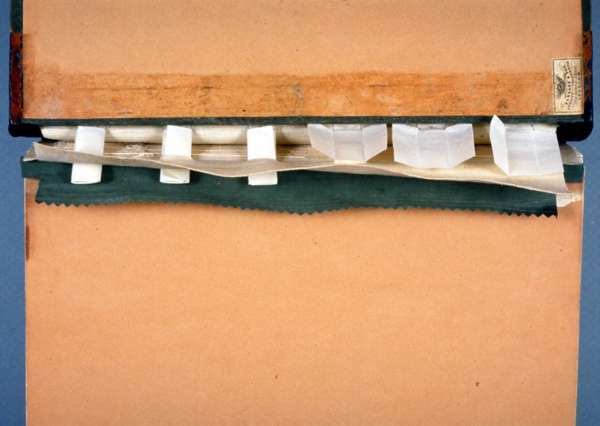 The text block was sewn by passing the individual threads through the gatherings and in and out of the holes in the sewing support (Fig 23). Each length of thread was knotted at the head and tail of each gathering. It was not always possible to use the original sewing holes in the gatherings because of the need to stagger the holes in the sewing support. Fig. 20 Rubbing of spine to determine location of sewing holes. Fig. 21 Determining the natural spacing of the sewn gatherings. Fig. 22 Drilling sewing stations in sewing support. Fig. 23 A view of the sewing. The cover was repaired by using the original boards and adding a new leather spine. The front cover was connected to the text block by adhering the flange that extends from the sewing support into a split in the board. The back cover was connected to the text block by parchment tabs. The parchment tabs extend from the back board and are pulled through slots in the sewing support flange (Fig. 24). Each tab was made so that two side flaps fold in over each other. When folded, the tab can be pulled through a slot. When unfolded, the tabs keep the cover connected to the sewing support. Fig. 24 Text to cover attachment showing parchment tabs and sewing support. To prepare the covers for the rebacking leather, the quarter leather covering material was lifted from the back board. The parchment tab-piece was adhered directly to the binders board (Fig. 25). The parchment was made long enough to allow for turn-ins, which were adhered under the paste down. With the parchment tabs in place, corresponding slots were cut in the joint area of the linen flange extending from the sewing support. Both the front and back boards were prepared by splitting the board open along the spine edge, two inches into the board (Fig. 26). Adhering the sewing support flange into the split in the front board, rather than just under the endpaper, provided a secure hinge attachment and protected Carroll's handwritten index on the pastedown. After the back board was split, wedges made of paper board were inserted at the head and the tail (Fig. 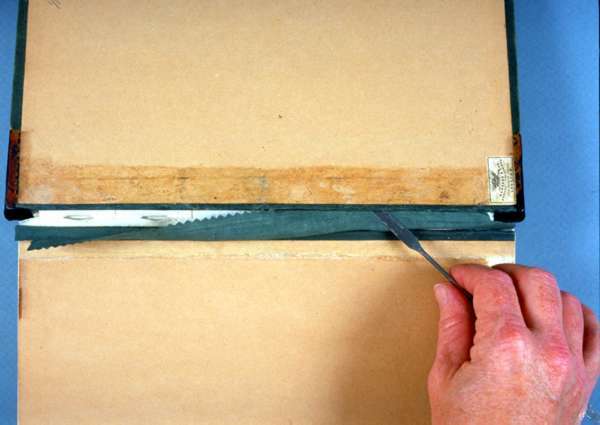 27) creating a gap in the split board that is wide enough to accommodate the tab and linen flange connection that is tucked in here. This gap made the back board only slightly thicker than before. Fig. 25 Parchment tab-piece adhered under quarter leather of front cover. Fig. 26 Back cover with lifted cover leather and split. Fig. 27 Wedges added to gap in the split at the back board. The cover was rebacked with goatskin (Figs. 28 and 29). 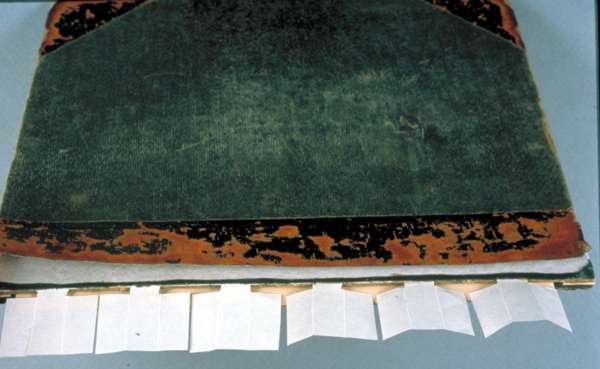 A piece of linen was also adhered to the boards under the leather to protect the sewing and the album from becoming soiled or damaged by leather dust. 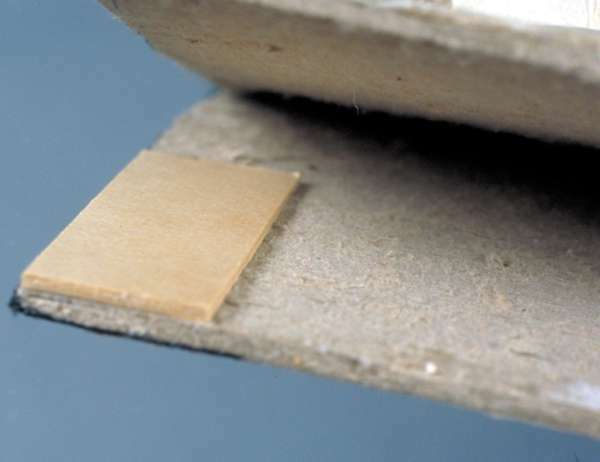 Before the rebacking leather was adhered, the parchment turn-ins were adhered around the edges of the board to reinforce the closure of the "split" board at the head and tail. Pre-testing of the structure with a model was most helpful here because it showed that the cover material would be stressed at the head and tail board edges whenever the tabs and flange were inserted or removed from the split in the board. Fig. 28. Rebacking leather adhered to cover board. Fig. 29. Rebacking leather adhered to cover board. Fig. 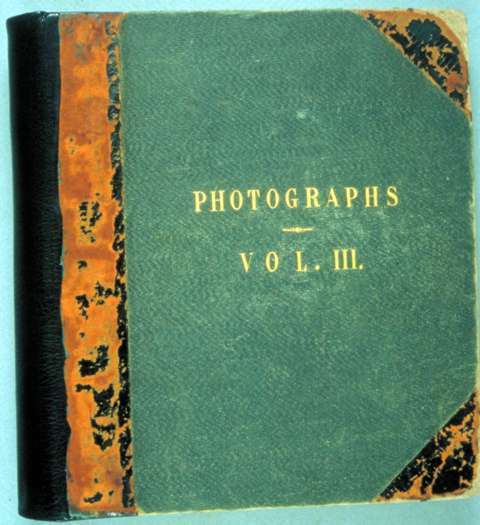 30 Spine of Photographs Vol. III. Fig. 31 Inflexible hollow back spine. Fig. 32 Tear in endpaper joint. Figure 34 shows the front cover of the finished binding. 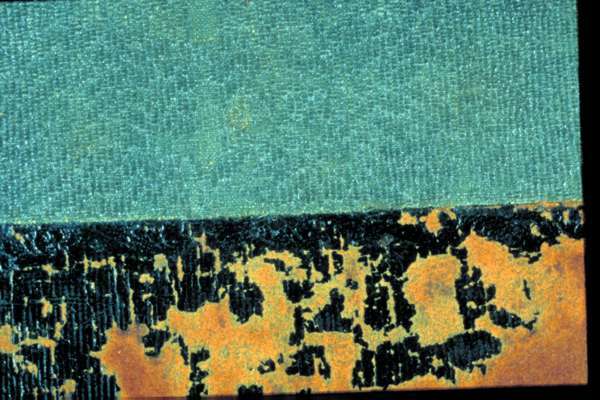 The difference in color between the new and deteriorated leather was not moderated because the curator prefers to let the researcher see the wear that the album has received. 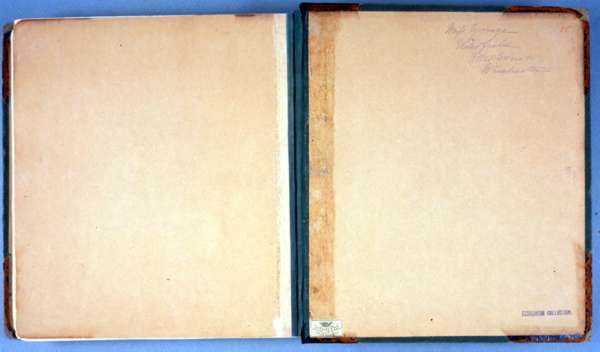 To remove photographs from the album, the toned endpaper hinge that covers the tab and slot connection (Fig. 35), and the parchment tabs (Fig. 36) are eased from the slit in the back cover. The sewing support flange is also eased out and the parchment tabs are folded and slid though the slots (Fig. 37). With the sewing accessible, the gathering with the photograph is located (Fig. 38) and the length of thread holding the gathering to the sewing support is cut allowing the photographs to be removed (Fig. 39). Gatherings made of Atlantis Silversafe with photocopies of the images may substitute for the original photographs, until they are returned to the album. Fig. 33 The finished binding, front cover. Fig. 34 The finished binding, back endpapers. Fig. 35 Removal of the toned endpaper hinge from board. Fig. 36 Removal of parchment tabs. Fig. 37 Undoing parchment tabs. Fig. 38 Cutting the thread of the gathering to be removed. Fig. 39 A detached gathering. There were a few considerations regarding the use of this structure. While the sewing support has overall flexibility, it does not conform to every gathering. When the book is opened, the gatherings tend to pull away from the sewing support. 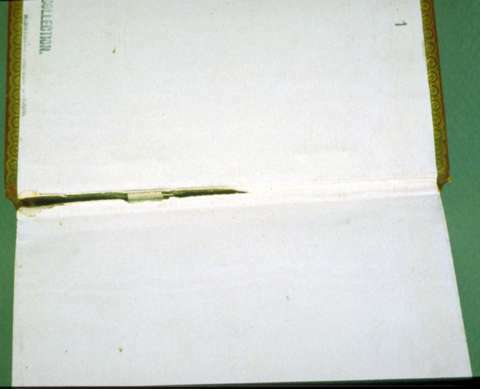 Although the paper in the Carroll album is strong, had the paper in the area of the spine folds been thin or weak, the sewing thread could tear through it. This, in fact, was one of the reasons that some of the experimental, non adhesive bindings were found to be unsuitable for many books. In addition, the entire album can twist, unlike books whose spines have layers of adhesives and linings. This movement could cause abrasion of the photographs. Our conclusions were that these two problems would, for the most part, be avoided by housing and careful handling (Fig. 41). The last and most interesting question, at least to me, is how durable will the tab and slot connection be? That remains to be seen, but our upcoming Lewis Carroll exhibition will give me a chance to try it out, since individual photos from this album are required for the exhibit. Fig. 40 Detail of gathering pulling away from stiff sewing support. Fig. 41 Movement of text block in this structure. Fig. 42 Album in rare book box. I would like to thank Linda Ogden, Tom Albro, Don Etherington, and Gary Frost for their information on experimental non adhesive binding structures, and my colleagues at the HRHRC, Jim Stroud, Mary Baughman, Barbara Brown, and Pat Ingram for their input on this treatment. Cohen, Morton Norton. Lewis Carroll: a biography . New York: Vintage Books. 1995. Cohen, Morton Norton, with Green, Roger L., eds. The letters of Lewis Carroll . New York: Oxford University Press, 1979. Gernsheim, Helmut. Lewis Carroll, photographer . 1949. New York: Dover. 1969. Fredericks, Maria. "Progress in Leather Conservation." WAAC Newsletter. 19.2 (1997): 29-32. Larsen, Rene, with Vest, Maria, Kejser, Ulla Bogvad, eds. Step Leather Project . Copenhagen, Denmark: The Royal Danish Academy of Fine Arts, School of Conservation. 1994. 17. Frost, Gary. "Conservation Binding Ideas." BookNotes . Austin: BookLab, Inc.
Jermann, Peter. "Flexible Strength: The Adhesive Quarter-joint Binding." New Library Scene . 13.4 (1994): 7-11; 24. Ogden, Linda McWilliams. "An Experimental Book Structure for Conservation." The Book and Paper Group Annual. 17 (1998). Paper delivered at the Book and Paper specialty group session, AIC 26th Annual Meeting, June 1-7, 1998, Arlington, Virginia.